Thanks to Theresa Sandberg for providing this wonderful article for our blog! Nothing makes me happier than digging around in the dirt, planting colors, harvesting edibles, photographing everything that is growing, and even weeding! I never imagined that I can still do all that while my mobility continues to deteriorate. I walk with leg braces and forearm crutches, and on ‘bad days’, I use a manual wheelchair to get around. Anticipating more of those ‘bad days’ to come, my husband Derek designed the front and backyard of our patio home for wheelchair accessibility. Our landscaper, Carmelo Longoria, has the uncanny ability to visualize and execute Derek’s arm waving designs, and together they made it possible for me to play in the garden. (1) Grass is evil, treacherous to walk with leg braces and impossible for a wheelchair, plus not ecofriendly. We have replaced all the grass with flower beds and hard surfaces that are much safer to walk on. Make sure the pathways are wide enough for the wheelchair. A loop path or one where you can turn around in the wheelchair is recommended, unless you are very good at wheeling backwards. I have collided into a pot or two that were on the edge of the pathways rolling backwards. (2) Be careful of gardening seats on wheels. They don’t have brakes, so you can end up sitting on the ground when they take off on their own. Wheelchairs are definitely safer. (3) I like to sit on the edges of the raised beds to work in the flower beds or just to sit to rest. Benches are great rest stops also. (4) Raised beds and big pots allow easy reach without too much bending. It’s amazing how many vegetables do great AND look great in pots, and you can jazz them up with some trailing colors. We have grown lemons, limes, guavas, potatoes, carrots, beets, soya beans, lettuce, eggplant, spinach, peppers and of course, all kinds of herbs in pots. Yum! (5) Angela Chandler’s High Density Orchard class at Arbor Gate is a must. 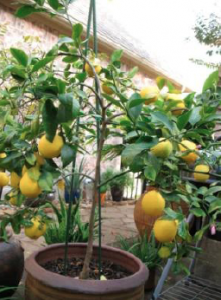 Short fruit trees allow easy access to prune, thin (gasp, yes!) and harvest fruits. Angela is overhauling the website www.thegardenacademy.com , but there are a lot of goodies there for reference. (6) I love my pop up yard waste containers. 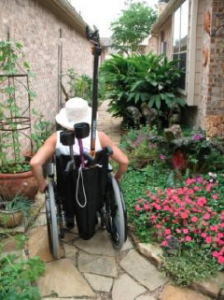 They are lightweight, and I can loop the pop up handle on my wheelchair handle and take it to any part of the yard. When not in use, they collapsed down out of sight. (7) Small plastic container with a fixed handle is great for carrying tools or harvests. The buckets with swinging handles interfere with forearm crutch walking, but are great for putting on the lap while wheeling. And don’t be tempted to put pointy tools in your pants pockets. (8) Long handle tools allow further reach from the chair. My new favorite, nick named ‘Marcus Agrippa’, is a gripper that you can get at any drugstore…to pick up prunings, do light weeding, poke holes, drop seeds and cover, and pinch the husband. (9) I have crutch holder pouch at the back of the wheelchair. These are also good to hold long poled tools. I cannot wait to get a permanent wheelchair just for gardening so that I can ‘pimp my wheelchair’ with a handyman’s belt to carry ALL my tools, buckets, and water bottle. 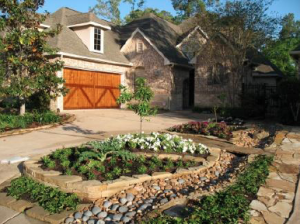 (10) Be sure to have a good landscaper who will make sure proper drainage is considered. Flagstones on crushed granite and French drains work really well. And, finally be sure to get approval from your home owners association before you start any modification.